The ‘fellowship’ was officially formed on 11th October 1987 at a general convention of family representatives held at Kuriachira St. Joseph’s English Medium Model School. 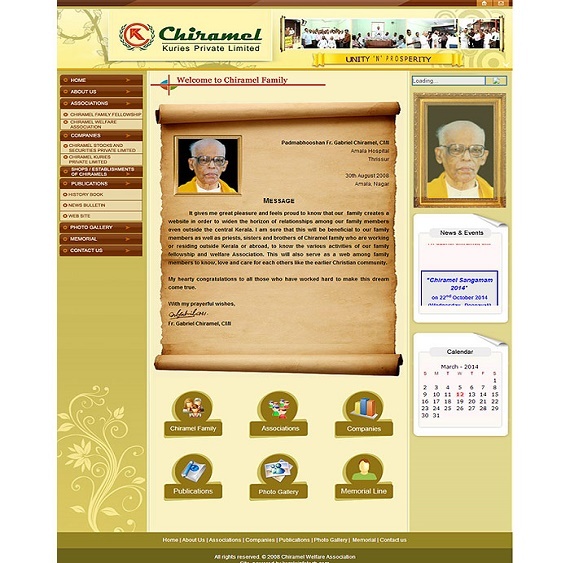 Well ahead of the formation of the fellowship, the efforts for publishing a family history book had begun by Acharya J.C. Chiramel and Fr. Antony Chiramel. But the task was fulfilled by Sri. C.O. Poulose, Chiramel Mulangadan, Kadukutty, in the year 1988. The Thattil Chettupuzhakaran family is one among the seven member families of the Thattil Clan, Which has its origin in the ancient Christian settlement of Pazhuvil Located in the western part of Thrissur District, 17 Kms from the city in the Thrissur-Thriprayar Road. By virtue of its nobility and culture this family finds an important place among the ‘Nazrani’-Thomas Christians of Kerala – families, legendarily claiming to be the descendants of those ancestors directly baptized by St. Thomas, one of the twelve Apostles of Lord Jesus Christ. 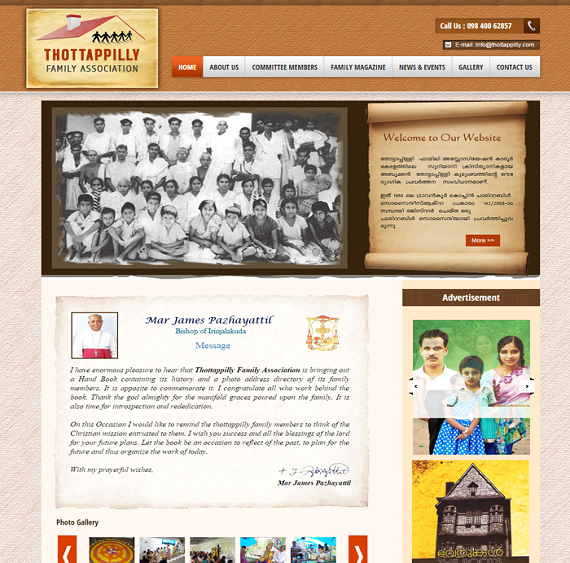 Thattil Mapila who belonged to this clan and whose tomb is situated in the graveyard of Pazhuvil Catholic Church was built in the year 960 AD and catered to the spiritual needs of the Christians including those in Thrissur and its outskirts. For the development of Thrissur, Sakthan Thampuran had invited few Catholic families to Thrissur and requested them to reside at Thrissur. Our family is also one among them invited and stayed at Puthenpetta town. At Thrissur, Kottekkattu, there was as business center and a port for down loading and uploading goods from the boat. Still there is a place named Attoru nearby that. 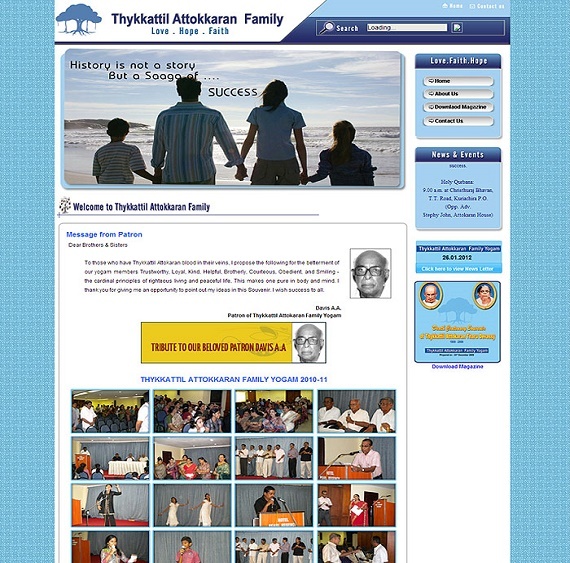 It is assumed that Thykkattil family was migrated from Attoru. So their family name Thykkattil added with Attoru as "Thykkattil Attoru". Just to support that, there are some families with their family name Kattookaran, Ollukaran, Pazhukaran etc. 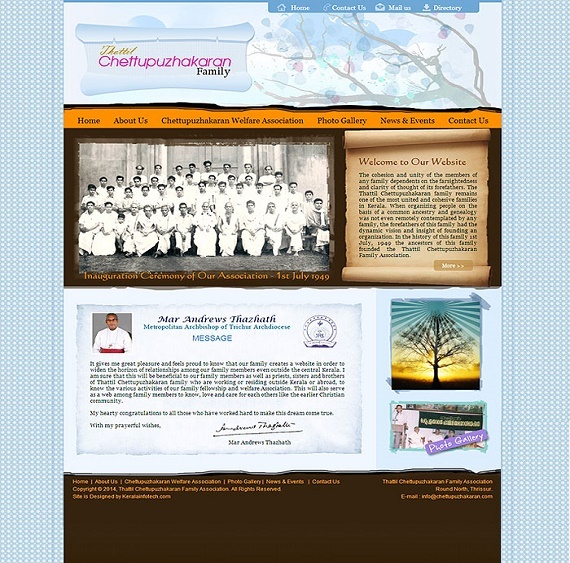 Detailed family history can be downloaded from the e-Magazine. Thengumpallil Kudumbayogam is a society of about 1500 members representing about 300 families known by different house names such as Thengumpallil, Vazhacharickal, Kariamkal etc. Even Thengumpallil is differently spelt us Thengumpally / Thengumpalli. We represent one of the branches of Plathottam Maha Kudumbayogam consisting of around 15000 members representing about 4000 families. Majority of members of Thengumpallil Kudumbayogam is staying in Kerala especially in the Central and Northern Districts. The others are spread in different countries around the world. Thengumpallil Kudumbayogam was officially established in 1990 by the sincere and gracious efforts of Sri. John Thengumpally supported by a team of dedicated family members. Since then we are holding one annual meeting of all family members in the month of April every year.